Welcome to China Report's Digital Introduction to the Beijing Exhibition Hall (Beijing Zhanlan Guan - 北京展览馆) in the Haidian District of Beijing. Together with the structures found at The Square of Heavenly Peace (Tian'An Men Square), the China Art Gallery and the Military Museum of the Chinese Revolution, the Beijing Exhibition Hall makes up the cities collection of old Soviet-styled architecture, meaning that it was constructed in the 1950's during the earliest years of the Peoples Republic of China. 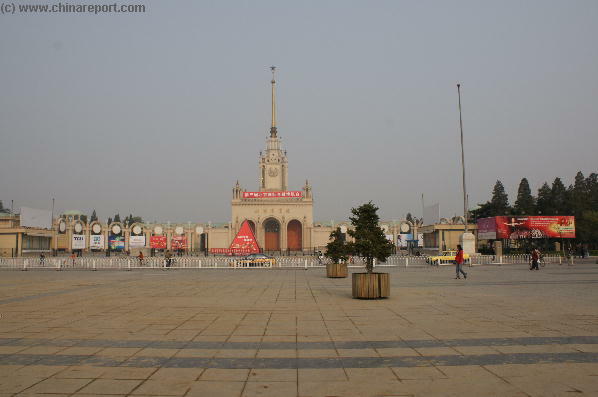 Beijing Exhibition Hall is located at Xizhimen Outer Street (Xizhimen Wai Dajie' - 西直门外大街) number 135, which is a halfways between Xizhimen Beijing Northern Station and the Beijing Zoo. Thus, the easiest way to find your way to Beijing Exhibition Hall for a visit is to first find the Xizhimen Station, which is a major metro and train Station found in the north-western corner of the City. 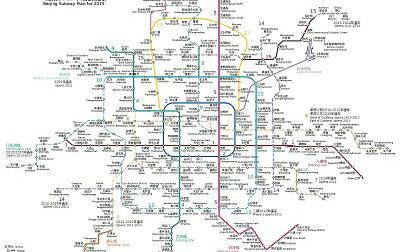 Travel to Xizhimen is fairly easy, as it is a station on the circular line 2 (Dark Blue) of the subway-metro system (See. 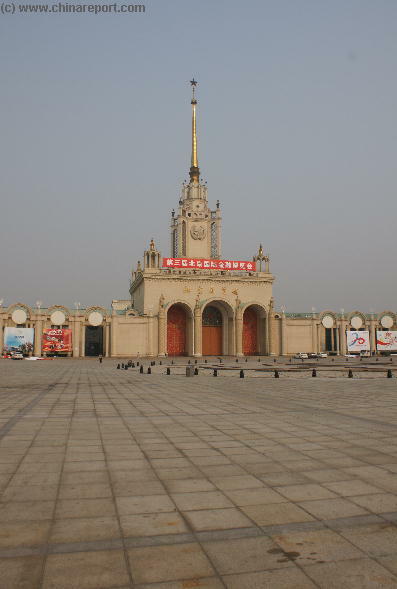 The Front and South Entrance to the 1950's Era Beijing Exhibition Hall, a monument to the the intimate Sino-Soviet Friendship Relations of the early years of the Peoples Republic of China. marvel in its time, completely breaking with earlier Chinese building traditions. As immediatly becomes clear upon laying sight on the building, Beijing Exhibition Hall has a number of Russian and Soviet features as it was designed to be similar to a famous collection of Soviet (U.S.S.R.) structures, namely the 'seven sisters' buildings or Stalinskie Vysotki (Russian: Сталинские высотки) which together comprise one of the Grand Monuments of the Soviet Era Capital of Moscow under Stalin's brutal rule. Although certainly not among today's main tourist venues, or a place of particular interest except for those with a liking to old era architecture, one can still easily catch a glimpse of the building and have a quick look about while on your way to the famous Beijing Zoo and its Panda House. Most recently Beijing Exhibition Hall mainly serves as the location of various trade and other conventions. 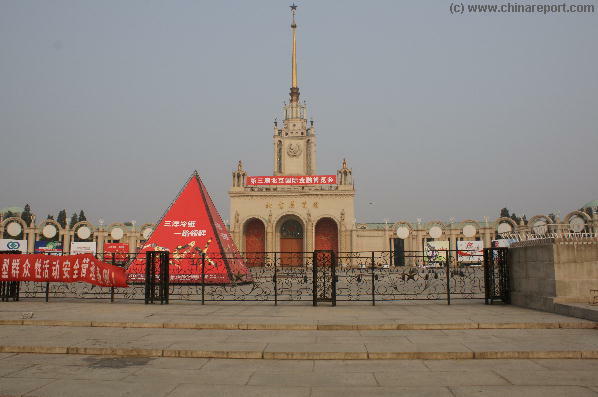 The Beijing Exhibition Hall should not be confused with the more modern Beijing Planning Exhibition Hall, which is an entirely different venue found at just south-east of Tiananmen Square at Qianmen Dongdajie in the Chongwen District. The Beijing Planning Exhibition Hall is the modern "museum of Beijing", a 4 story building constructed as part of the Olympic Presentation where among things one can enjoy a 17-minute 3D movie that animates all 3500 years of the city's history. At the Planning Exhibition Hall one can get aquainted with the plans for the modern and enlarged city of Beijing and there are also exhibitions on the nuances of the "Siheyuan" traditional courtyard houses, the epitome of Beijing traditional "Hutong" (alley) buildings. 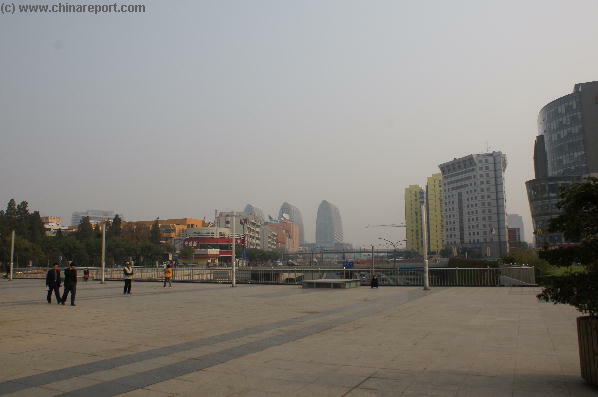 A view from the square in front of Beijing Exhibition Hall towards the East, Beizhan Bridge and the Three Towers that mark the location of Xizhimen (Beijing North) Station. outside to get our bearings. The Beijing Exhibition Hall stands due West of Xizhimen Station along Xizhimen Outer Street, which is also the route to the Beijing Zoo. Just follow the crowds walking along the main road heading west. It is a stiff, almost 10 minute walk, but then Beijing Exhibition Hall comes into view. It can hardly be missed. Anyone who would like to avoid the walk can either choose the electric-cable bus from Xizhimen. Choose Cable Bus 102, 103, 105, 107 or 111 at Xizhimen heading westward, or when visiting the Beijing Zoo first take Cable Bus Cable car 102, 103, 105, 107 or 111 at Beijing Zoo and head East along Xizhimen Outer Street towards the city, getting off at the next stop, which is the Beijing Exhibition Center. Beijing Exhibition Hall consist of a Central Exhibition Hall, an eastern wing with 3 exhibition halls and a west wing featuring a 2700 multi-level Amphi-theatre and additional entertainment and leisure. With its large display hall, the theater and well-known Moscow Restaurant, is a unique complex of buildings in Beijing and one of the very view with a distinctive Russian Style. Currently, the complex occupies about 200,000 square meters and is the designated spot for large-scale exhibitions related to science and technology, economy and trade, culture and civilization, as well as military affairs. Many of its exhibitions are yearly events. The Southern Facade and main entrance of the Beijing Exhibition Hall fronted by a huge concrete slab entrance square. after the turn of the millenium, today the Exhibition Hall has refound some of its earlier popularity as a new influx of Russian migrants and traders loves to visit Beijing's most famous Russian Restaurant aptly named "Moscow". The Moscow Restaurant, which features typically Russian and also other styles of western style cuisine, is busy and booked virtually every day around the year, lending some much needed evening activity to the sprawling old school stalinist complex. Other in-house features are the movie theater, a joint venture hotel, a pastry factory, several travel agencies, and a few commercial and semi-commercial operations such as art galleries. By now, the large scale exhibition center has been revived into one of the centers for entertainment and leisure in the otherwise thriving and busstling Xizhimen Downtown Business Districts, together with the nearby venues of are the Beijing Zoo, the Beijing Sea Aquarium, The Beijing Planetarium offering an interesting array of entertainment options. the highpoint of Sino-Soviet relations in the aftermath of the Korean War (Chinese: Hanja 韓國戰爭) (25 June 1950 – 27 July 1953), at the time becoming the first ever large scale exhibition center and space in the Capital City of China. At the time it was regarded as very modern, including suspended cranes to carry heavy loads to their assigned positions. The south gate entrance arch with inscription by Mao Zedong (in Gold). the importance attached to the building of the Hall in this period in which China was learning from the Soviet Union on how to build a viable "Socialist" economy in both agriculture and economy, the main entrance arch of the exhibition hall carries the inscription of Chairman Mao Zedong and at its grandiose opening ceremony the ribbon was cut by the Premier Zhou Enlai. A year later in 1955, as another reflection of friendly Sino-Soviet relations, a similar exhibition Hall and complex known as SEC (Shanghai Exhibition Center) was opened in the City of Shanghai. In 1958 the Beijing Exhibition Hall was officially renamed as the Beijing Exhibition Center on instigation of Premier Zhou Enlai. International Exhibitions. Listed among the most notable events at the Hall are the annual International Military Logistics Equipment Exhibition, the 1996 to 1999 China International Financial Technical Exhibitions, and the 1997 Italy Marco Polo Fashion Expo. During the 1980's the Beijing Exhibition Center (Hall) was one of the first State owned venues to be converted into a state owned commercial enterprise, becoming one of the showcases and test-beds of Deng Xiaoping's now famous Policy of Economic Reform and "Opening-up" to the outside world. In 1990 during the 11Th Asian Games, which were held in Beijing, Beijing Exhibition Center was used as a grand shopping mall for foreign athletes and sports staffs. In 1997, the Hall was chosen as the location of the propaganda showcase lauding the achievements of the Peoples Republic's 14th Communist Party Congress. Two years later, in 1999 the center held a grand forty-day exhibition marking the 50th anniversary of the founding of the People's Republic of China. For the occasion, delegations from 33 regions attended to demonstrate the successes in politics, economy, culture, education, defense and science in the fifty years history of the new China. The highlights of this particular exhibition were the exhibitions from Hong Kong (S.A.R.) and Macau (S.A.R. ), two former colonies which had recently been "returned to the motherland". Large scale renovations in the year 2000 completely revised the Hall and introduced a number of facilities to make the exhibition center more modern and attractive to the current public. AsiaReport.com generated Google Map Overview of the location of Beijing Exhibition Hall east adjacent of Beijing Zoo in the Haidian District of Beijing. dance or when younger, race about on inline skates (roller blades) or otherwise pass the time with their friends. Looking to join some Tai Chi exercise? Come around in the early morning and join one of the groups.